Jackdaws – Coming to a Chimney Near You! One of the joys of Spring is that so much comes to life – especially the birds singing cheerfully in the mornings and inevitably the start of nesting season and all’s well with the world. Well, unless of course the birds are nesting in your chimney, whereupon the joy can come out of it when you start to notice twigs, rubble, cement, sometimes bird droppings, coming down your chimney! At worst, some customers have even reported of finding dead birds in their grate or have experienced and over powering smell and a plague of flies. Sometimes we’ve had reports of birds flying around their lounges! Please don’t get us wrong, we love birds and do not knowingly destroy or remove any live nests – it would be wrong to do so and their nests and eggs are protected. However, if left or undiscovered, can be a huge fire hazard, blocking your flue! Only old nests can be removed so if you suspect a new one has appeared, this will need to be left for some time until nesting season has ended and the birds and their chicks have long moved on. Nesting season is between April and July and if your chimney isn’t fitted with a bird guard or cap, there’s every chance one of our feathered friends may take root in your stack for a while. Look out for activity around your pot and signs of nesting. Look out for bird activity! The culprits are almost always jackdaws, because in the wild, they are used to nesting in holes in trees and clefts in the rock, and chimneys correspond very closely to what they are used to in the wild. The architectural skills of jackdaws are such that removing a nest from the chimney can take a lot of time and effort. Seriously. There have been times when a skip was needed because there was so much material coming out of the chimney that nothing less would contain it all. Plus, the sheer physical effort is completely exhausting. Now why is that? Well, the jackdaws use a very simple technique. They choose twigs that are nice and springy, and grasping the twig firmly in their beaks, they dive into the chimney, and push on down until the twig jams in the flue. Then they repeat that and twig by twig, the mass in the chimney builds up. For the sweep, the base of the nest is a serious obstacle, as the twigs being curved, they soak up a huge amount of impact energy, so just hitting it with a brush simply won’t do any good. Removal of a nest can be very time consuming and difficult. 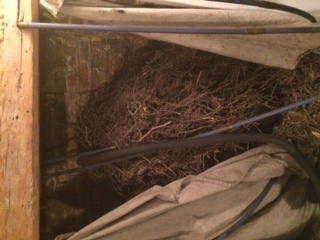 The nest must be stabbed by several implements designed to break this resistant mass up and get more and more twigs to break and fall down the chimney. Once enough of the nest has fallen, the structure of the nest becomes weak and vulnerable to a bit of nifty brushwork. Now having to endure the mess and inconvenience of someone removing huge amounts of dirty, dusty twigs from your chimney is bad enough, but when on top of that you end up having to pay for half a day’s labour, it becomes even less amusing. 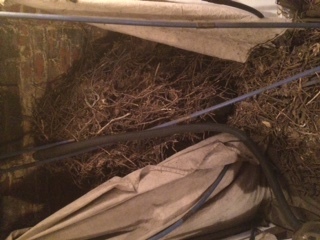 The biggest nest ever seen by our sweeping team was recently removed from a customer’s chimney- taking 4 hours to clear and filled 35 bags! If left, these nests can dry out and become excellent kindling for a chimney fire and are extremely hazardous! Plus, there is the danger of fumes to consider. Now while some may disregard this, carbon monoxide is dangerous, and it bears repeating. Birds nesting in a live chimney flue can create a carbon monoxide hazard as there is no way for the gas to escape from the room –carbon monoxide is a silent killer. Never, ever tolerate a blocked flue that is causing fumes to spill back into the living space. Put simply, FUMES CAN KILL. Do make sure you have a suitable CO alarm fitted if you’re burning solid fuel or use a gas fired appliance in your home and check these regularly to makes sure the batteries aren’t dead! So, for several reasons, it really does pay to keep birds and their nests out of your chimney. 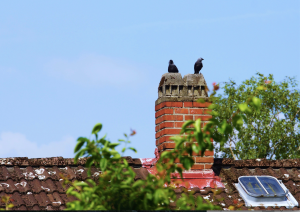 You may wish to consider having additional chimneys at your property protected too as jackdaws tend to return to the same place each year so by making your flue bird proof will prevent birds nesting year after year. We can arrange to have a bird guard fitted as well to prevent any further intrusion. We like to inform our customers of what to look out for and how to avoid the associated problems and dangers with birds nesting in their chimneys, so if you suspect you have a nest in your chimney, do not light a fire to burn out the nest! Please do get in touch to book a chimney inspection and one of our trained chimney sweeps will be able to come out to your property and advise on what’s the best action to take.